This window, titled “The Visit of the Wise Men to the Manger Cradle,” was given in memory of Andrew Barton Jones and of his wife, Alice Tucker Jones by their children, and dedicated on Trinity Sunday, May 18, 1913. The window was designed by Frederick S. Lamb and executed by J. & R. Lamb, New York. 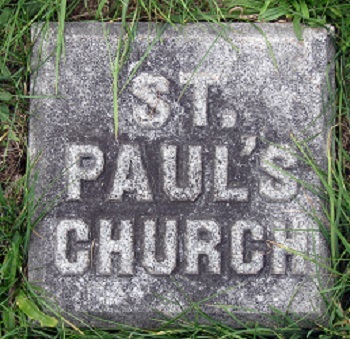 Andrew B. Jones (19 May 1840 — 29 May 1909) was a St. Paul’s vestryman from 1892-1902 and warden 1902-1909. He and Alice Tucker Jones (13 May 1843 –10 Jun 1891) had five children, one of whom was also a long-time member of the congregation. Like his father, Sydney Tucker Jones (1878-1958) was a St. Paul’s vestryman and warden, serving forty years in those roles, most of them as senior warden. He married Gwenola Smith, and the couple’s daughter Alice Tucker Jones married George A. Taylor, St. Paul’s rector from 1932 until 1948. This entry was posted in Vestry, Windows, Windows on January 6, 2017 by Paul Nance.